Wash and quarter the key limes. In a dry skillet, toast the fenugreek and brown mustard seeds until the mustard seeds begin to pop. Add these to the limes along with all remaining ingredients. Toss to combine. Pack a quart glass jar half way with the limes, then with a muddler or heavy wooden spoon, mash the lime quarters to release their juices. 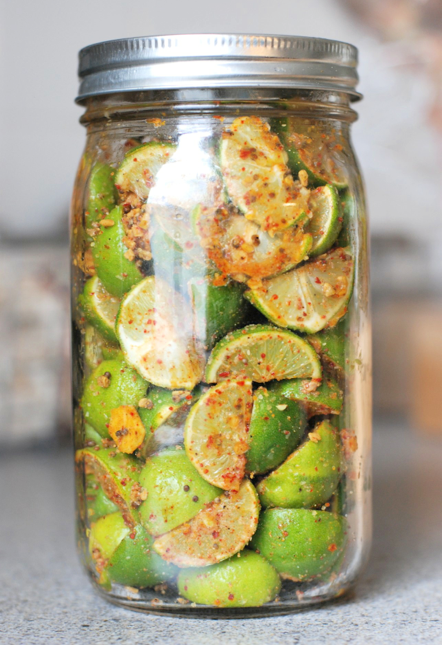 Continue adding limes until the jar is full, mashing as you go. Lightly screw on the lid, and leave on the counter. The mixture should begin to ferment over the next few days. The limes take a good month or longer to soften and for the flavors to meld.